Learn a two-chord folk song with this Li’l Liza Jane easy ukulele tutorial complete with lyrics, chords and tab on screen. 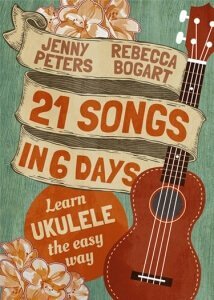 Li’l Liza Jane is one of the songs in our upcoming book 21 Easy Ukulele Folk Songs. With this Lil Liza Jane easy ukulele tutorial, you’ll need only two chords! But Jenny does it in two keys – F and C – so you’ll see a total of four chords. In the key of F, you’ll need F and C7 while in the key of C, you’ll need C and G7. You can learn to play the song in both keys or just choose which key works better for you and stick with that. For the strumming pattern, Jenny does a D-DU-D-DU repetition (D-down, U-up). But for those that enjoy playing solo ukulele, Jenny also plays the chord melody in the latter part of the video. If you want to interact with Jenny and learn more about how to play this folk song, join us on Facebook and tune in on Thursday for Jenny’s Facebook Live Lesson. In case you missed the live session, a video recording will be saved on the videos section of Facebook that you can watch anytime. In addition, subscribe here to get notifications about new videos every week and receive sheet music of these videos. As with most folk songs, it is not known when Li’l Liza Jane was first composed. However, a California publishing house first released a sheet music of the song in 1916 citing Countess Ada De Lachau as composer. Many musicians in different genres have recorded the song. For instance, Earl Fuller and his band released a jazz version in 1917 while Harry C. Browne released a country rendition in 1918. Other notable singers who recorded the song include Bing Crosby, Nina Simone, David Bowie, The Band and Alison Krauss.